Very solid student flute, highly recommended for young learners. 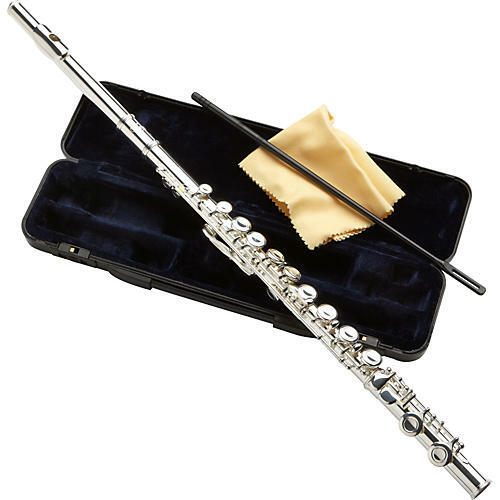 The Etude EFL-100 flute is a quality instrument to fit any budget. It features a silver-plated head, body, and foot for beauty as well as durability. The C foot and offset-G key help make the instrument easier to hold and play for those with smaller hands. The foot joint and the head joint fit snugly into the body, with no slipping or wobbling, a common failing of many student flutes. The keys feel great, notably the spatula keys (the ones that rest underneasth the pinky fingers). They are contoured and comfortable, and located precisely where they are accessible without straining. Likewise the thumb keys are smooth and comfortable. The finish is a bright silver plate, very pretty. It also has a lush, rich timbre that projects very well. Etude believes that price should not be a barrier to experiencing the growth and joy that comes from making music. That' why Etude offers you five of the most popular woodwind and brass instruments at an incredible price: flute, clarinet, alto sax, trumpet, and trombone. And no matter which you choose, you get a great design and outstanding construction that will give you years of musical enjoyment. See for yourself.